Every once in a while I find myself in the mood for a hot and spicy smoothie. In order to heat up my smoothies I simply add a little chili powder or cayenne pepper. If you haven’t tried a hot smoothie, I encourage you to give it a whirl. Besides being a nice change of pace, spices such as chili powder offer their own unique health benefits. Chili powder is rich in vitamins A and C. Vitamin A supports your eyesight and the health of your bones, teeth, and skin. Vitamin C is a potent antioxidant, boosts your immune system, and helps in recovery from injury. Chili powder is also rich in the minerals potassium, phosphorus, calcium, and iron and contains a little zinc, manganese, and selenium. 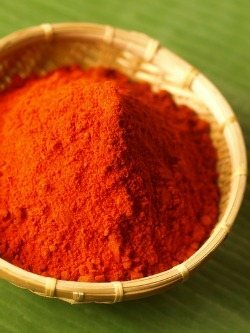 As an anti-inflammatory, chili powder can bring relief to achy joints as well as arthritic swelling and pain. Chili powder has also been shown to support a healthy cardiovascular system, clear congestion, help with blood sugar, and act as a natural pain reliever. Don’t just spice up your smoothies, sprinkle a little chili powder into other dishes for more pronounced health benefits. Not a fan of hot and spicy? Simply omit the chili powder and enjoy a delicious and highly nutritious green smoothie. This recipe call for 1/4 teaspoon of chili powder, which isn’t a lot, if you really like it hot use up to 1 teaspoon or more. Enjoy! I’d love to know if you tried this hot and spicy green smoothie – please do tell in the comments below. Happy Blending!